We know women love clothing that fits them perfectly and complements their own personal style. But your chances of getting hold of such a garment on the high street is about as likely as the National Enquirer producing real news. That’s why we want to tell you about our range of stunning bespoke garments for women, how we meticulously create them, and the luxurious fabrics you can choose from for your custom made clothing. We design and create a wide range of beautiful custom made clothing for women, from plain white business shirts that will become a staple of your wardrobe, to stylish ladies’ business suits which look fantastic in and out of the office. Whether you work in a conservative law practice or an über cool creative agency, we can create the ideal trouser suit for you. This will involve looking at which styles, fabrics (see below), lining colors, lapels, pockets, buttons and much more will work together to get you the sharp, stylish look you want. We also recommend you add a made to measure skirt to give you extra flexibility, and an extra pair of pants, as they are much more likely to tire over time than your jacket. We have a wealth of experience designing and making made to order suits for women for special occasions. This includes perfectly fitting wedding suits and tuxedos for your big day if you opt to go the non-traditional route instead of a dress. For your wedding, this really is a great option, especially if you want something completely unique that reflects who you are and the fashion you love. Check out our boards on Pinterest for some inspiring ideas. Once you wear a made to measure dress shirt or blouse, it’s really hard to go back to ill-fitting shirts bought off the rack. The way they look, fit and allow you to move is something truly special that can’t be replicated through mass production. To create your bespoke shirt or blouse, we will take a series of precise measurements to ensure the most flattering silhouette for your body shape and a perfect fit. We’ll also offer you guidance on choosing from our vast range of exquisite fabrics and all the options regarding your shirt’s collar, pockets, cuffs, buttons, and placket. A tailored blazer is a great addition to any woman’s closet, because of their timeless look and versatility. The great thing about asking HKT to create a made to measure jacket for you is that you can create the look of your dreams. You chose the color. You choose the length. You choose the style. You choose single or double breasted. You choose… well, we’re sure you get the picture. The options are pretty much limitless, but the result is always the same: a stunning custom jacket that perfectly conforms to your body shape and makes you look extremely stylish in any setting. A fitted vest (waistcoat) can be a great addition to a beautifully tailored suit, if you want to create a strong, timeless look. Or how about a vest in a heavy material like tweed, which looks really great with a white shirt and a pair of jeans or casual pants? As always, we can help you pick the ideal fabric and style for you and where you’re planning to wear your bespoke vest. You can also embellish your waistcoat in numerous ways, such as choosing a patterned silk for the reverse or brightly colored buttons, stitching or trims on the edges of pockets. Whether you’re slim or curvy, tall or petite, we can make superior bespoke pants that will give you a flattering silhouette from all angles and be incredibly comfortable to wear. Once again, you can pick from hundreds of wonderful fabrics that come in a vast range of colors and weights. This includes beautiful silks for lighter, flowing trousers, and stretch woollen fabrics for something more fitted and structured. You’ll also be able to choose whether you have pleated or flat fronted pants, how many belt loops you have, the shape and location of your pockets, and much, much more. Whatever garment you’d like created for you, our bespoke process begins with you having a chat with one of our style consultants about the type of item you want, the style you’d like and where you’ll be wearing your new clothing. Once we’ve discussed these areas, we’ll then begin to look at the many fabric options available to you (see below) and all the exciting details you can select to create a look that truly reflects your individual character and personal style. 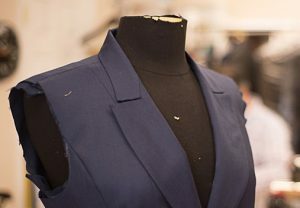 After finalising the design and fabric, our tailors will then take a series of precise measurements from around your body and note the unique characteristics of your physique. This ensures your new garment perfectly conforms with your body and creates a shape that hangs and moves like no off-the-peg piece of clothing ever could. Following the creation of your bespoke garment, we’ll then invite you to our store for a first fitting. Often, because of our meticulous attention to detail, many of our customers love everything about their new item as soon as they try it on. But if we feel adjustments need to be made to create an even better fit or look for you, we’ll mark up these alterations, implement them in a matter of days, and then invite you back for a final fitting. By choosing to have a bespoke garment made by HKT, you gain access to thousands of luxurious cloths from all over the world. This includes beautiful fabrics produced by Holland & Sherry of Saville Row, London, England, and Loro Piana of Italy. They create some of the world’s highest quality cloths for women’s suits, blazers and vests, including exquisite wool fabrics with stretch, which are perfect for pants that look amazing and feel even better, as they offer lots of movement. We also stock shirt and blouse fabrics in more colors, patterns and textures than you can imagine, including Egyptian cotton, sea island cotton and 120s 2-ply cotton. These are produced by world-leading brands such as Canclini, Thomas Mason and Albini. You can also personalize your shirt with the exact buttons, collar, cuffs and pockets you want, allowing you to create the shirt of your dreams. So there you have it, a quick overview of all the stunning bespoke garments we create for women. We hope it inspires you to get in touch and discuss what you would like to be made for you. Just give us a call on 770-458-8682 or book your appointment at https://hktclothiers.com/appointments/ to book your free style consultation. Or if you’re looking to have something created for a loved one as a gift, please get in touch too. Our expert tailors can create the perfect gift using clothing a loved one already wears, or measurements we already have on file, if we’ve previously created something for them.